The Jazz Brat's Blog Page: Them Broads Still Got It! Them Broads Still Got It! I have been to see "Broadsway", the remarkable trio of Heather Bambrick, Julie Michels and Diane Leah, twice now. Each time there has been a terrible storm of some sort. Yet each time, despite that, the house was packed. It seems whatever the weather Gods throw their way, the Broads still come out on top! I first caught the Broadsway show ( 'cause that's what it is, a show, not just a night of music, but a full on FLOOR SHOW) at The Flying Beaver Pubaret. The Beaver is a fantastic newish venue in Toronto that has quickly become the go-to place for those who are music or theatre lovers and open-minded. One of the problems I have with jazz venues in Toronto is the propensity for "Husband" and "Wife" (older jazz snobs, there for cache, not the music) to show up and ruin the night with their holier than thou attitude and poor behaviour. You will NEVER find husband and wife at The Beaver! The evening of the Broadsway show at Flying Beaver there was a major snow storm that shut down the entire city, but it didn't keep the fans away. The Beaver was packed! All for these three groovy Broads! 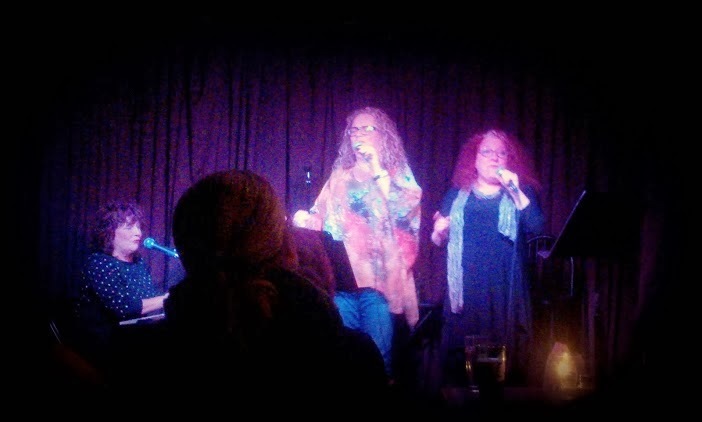 That night the ladies whispered to the audience that Broadsway would be part of the soon to be announced JazzFM Cabaret Series at Hugh's Room. I realized in that moment that "Cabaret" was the perfect descriptor for their act and knew it would be a great night of entertainment. I grabbed tickets as soon as I could! My handsome man and I traipsed through yet another nasty storm last Thursday evening to Hugh's Room. Hugh's, like Flying Beaver, is a favoured venue of mine. You still get the occasional "husband" or "wife" but the room is laid out so well they are generally not a problem. I usually grab the 2 seats at the bar instead of a table because of the unbelievable view. But for Broadsway, it wasn't to be. Tickets had sold so quickly, and reservations booked so far in advance, that even my seats were gone. The floor staff at Hugh's are top-drawer, and know me well. They brought handsome man and I in and had a first-class table for two ready that they knew would make me happy. And they were right! Hugh's Room is a much larger venue than Flying Beaver. Much. One of the things I had LOVED about my virgin foray to Broadsway was the intimacy. In the review I wrote of that night, I said it was like being in the kitchen with your three favourite aunties as they regaled you with songs and stories. They had us laughing so hard that, to paraphrase Elaine from Seinfeld, they were "Depends-Worthy"! I wasn't sure how that would translate to the larger space. Furthermore, Heather Bambrick, whose soprano voice is always a joy to listen to, was suffering from sinusitis, struggling all day to find a remedy that wouldn't knock her out. So I was excited, but a little concerned. I needn't have worried, the Broads, it seems, never disappoint! Jaymz Bee of JazzFM emceed and set a communal tone that was to last the whole evening. When Heather, Julie and Diane took to the stage, the room willingly became putty in their hands. Every person felt that the Broads were singing and camping it up just for them alone. Talent shone, but personalities glowed! Charming, witty, and sometimes raunchy, never once do the Broads allow their floor show to outshine the music. Each of these marvelous ladies are, and have been for quite some time, very well known in the industry for their talent, dedication and focus. Each a perfectionist in her own way, but boisterous and laid back in others. The three balance each other out in the way a long-and-happily-married couple does. The result is a night of music exceptionally arranged by Diane Leah running the gamut from jazz to Broadway to pop with a healthy dose of humour, keeping a grin on your face and a warmth in your heart throughout the evening. February is a LONG and OH SO GRAY month, but it was made bright and joyful with the marvelous Cabaret that is "Broadsway"! Ladies, you're still Three "Depends-Worthy" Broads! Allyson Morris and her All-Star Band at Jazz bistro Jan 14,2014 Why YOU shouldnt miss this! Valentine's Day is all about LOVE! So Check out this fabulous event guide made for LOVERS of live music! A night with Joey D, his phenomenal B3 and maybe a crystal ball!